Even the death of her subject did not discontinue the message of director Hannah Engelson’s documentary about Uptown resident, comedian and disabilities advocate Jonah Bascle, which won a special jury mention at this year’s New Orleans Film Festival. “My original intention was just to give a well-rounded picture of this person and I think I still accomplished that,” Engelson said. Engelson met Bascle in November 2010, after Bascle had earlier in the year run for mayor to bring awareness to the lack of services in New Orleans for disabled residents. They met at a meetup for a film group. “He told me he was making a documentary about himself and that I could help. I think he meant it as a joke, but in reality he was filming just a lot of stuff in his life,” Engelson said in a phone interview. She said Bascle was filming some of his sketch comedy and stand up, which he often performed at La Nuit Comedy Theater on Freret Street. Engelson eventually started filming some herself, and then she successfully funded a Kickstarter in 2014, so she could film full time. 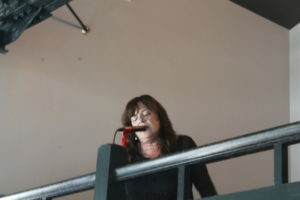 Sue Ford, DiNOLA vocalist and mother of brothers Jesse Bascle and Jonah Bascle, often worked alongside Jonah on each other’s art projects, including Ford’s work on some of the New Orleans buildings in the animation set of “Jonah Stands Up.” The song “I Wanna Die in New Orleans” is featured in the short film and was played at the pre-screening party held in Ace Hotel. Ford said Engelson was immediately comfortable to be around in her shooting, which was “key,” but the director’s plans for the documentary had to be changed, due to Jonah Bascle’s declining health. Engelson had been filming full time for about 6 months when Jonah Bascle died. She worked with two different editors in 2015 and worked on the stop-motion animation sequences while the film was being looked over. She didn’t plan to have these sequences in originally, but later thought it would make sense, since she and Jonah Bascle “chipped away” at the project for a couple of years. Ford explained that Jonah Bascle’s commitment to action — the way he could transform his living space around him — was the documentary’s original focus, and that activity of his largely involved getting other people to do the heavy lifting. He would try and motivate those around him to do what he could not. The documentary was always going to touch on his illness to help people to better understand muscular dystrophy. Ford said that her son didn’t originally set out to speak for many other people in wheelchairs, but his older brother Jesse Bascle said those similarities with people were part of why he ran for mayor. “He started as a comedian but then figured out there were things stopping him from doing what he wanted to do, but then he realized there’s other people like him,” Bascle said. Jesse Bascle joked that whatever made his brother mad motivated him to do something about it, and he just wouldn’t use his disability as an excuse a lot of times. Jonah Bascle’s mother said his passion for comedy despite his situation brought his young doctor to confused tears, while the family continued to laugh, as the comedian wrote jokes as long as he could. His elder brother Jesse Bascle recalled Jonah asking for a funeral-themed birthday party once, which he refused to do, and their mother retold the jokes the comedian made for staying in a children’s hospital. “‘What’s with all these screaming kids all the time? Look at these handprints! These kids are out of control,'” Ford recalled. Engelson said at the New Orleans Film Festival Screening that she had been asked by everyone where was her camera, when she first visited Jonah Bascle in the hospital. An audience member told Engelson during Q & A after the film that they were in love with the story and thought it was beautiful, and the festival jury awarded it with a special mention in the “Louisiana Short” category. “I think because he so willingly shared his life with the camera, I think audiences are willing to get to know him through a documentary,” Engelson said in a phone interview. For Ford, her son’s story shows that New Orleans is definitely not accessible, but that people with his bravery and determination have the potential to bring change. “You can make a difference for sure. I think,” Ford said. 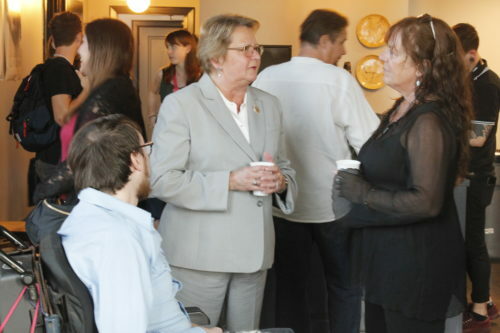 Director Engleton acknowledged that there is a stigma surrounding those in wheelchairs or who live with disabilities, and she said there are general problems with accessibility in New Orleans and Beyond. 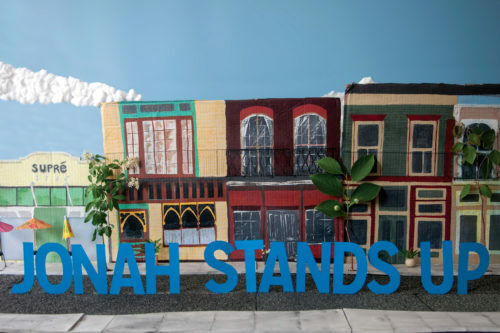 “Jonah Stands Up” documents his comedy, advocacy, and art, even as he confronted his illness, wheelchair, and mortality. “Jonah Stands Up,” a short documentary film about the late comedian and activist Jonah Bascle will next be shared with audiences at the St. Louis Film Festival in early Nov.